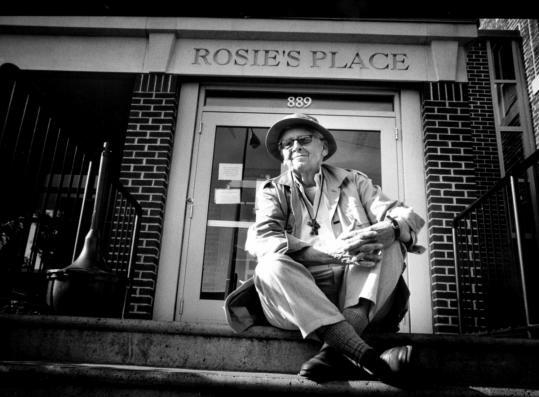 Kip Tiernan, who founded Rosie’s Place, the nation’s first shelter for homeless women, and whose persistent, raspy voice echoed from the streets to the State House as she advocated for the poor, died of cancer Saturday in her South End apartment. Usually clad in a canvas hat and work pants, a cross and a skate key dangling from a leather strap around her neck, Ms. Tiernan helped create an A-to-Z of agencies that assist the disadvantaged in Massachusetts. By example, she also inspired so many people to try to ease suffering that, directly or indirectly, she may have touched more lives of the poor in the Commonwealth than anyone else in the past four decades. Along with Fran Froehlich, her partner in advocacy for more than 35 years, Ms. Tiernan founded, helped found, or was a founding member of a number of agencies and panels, including Boston Health Care for the Homeless, Boston Food Bank, Community Works, Aid to Incarcerated Mothers, Finex House, Food for Free, John Leary House, My Sister’s Place, Transition House, the Greater Boston Union of the Homeless, and Boston’s Emergency Shelter Commission. Strong words were her response more often than tears, however. Drawn by faith to her calling, she brought unconditional love to each encounter with the homeless, and she didn’t hesitate to criticize the powerful if they backed what she believed were unfair policies or tried to slide by with words of pity. The cross she wore was more than a symbol. On behalf of housing, health care, and an array of social justice issues, Ms. Tiernan lobbied, fasted, marched in protest, and was arrested during sit-ins at government offices. In November 1990, she began a fast in Arlington Street Church and explained why in an op-ed essay for the Globe. Before founding Rosie’s Place in 1974, Ms. Tiernan traveled to meet with legendary Catholic activist Dorothy Day, from whose life she drew inspiration and spiritual sustenance for the decades that lay ahead. Born in West Haven, Conn., Ms. Tiernan was 6 months old when her father died and 11 when her mother died. Raised by her maternal grandmother, she learned during the Great Depression to help others. By her teens, she was learning to fly a plane and play jazz piano. She also was expelled from a Catholic boarding school, telling the Globe she had failed math and asked too many difficult moral questions. Ms. Tiernan joined Alcoholics Anonymous, learned from recovering street drunks how to stay sober, and became a successful advertising copywriter with her own agency. In 1968, she did some free work for priests who had invited activist Daniel Berrigan to speak at a church. A service will be announced for Ms. Tiernan, whose longtime companion of decades, Edith Nicholson, died in the 1990s. Ms. Tiernan helped raise Nicholson’s three children and leaves one of those children, Peg Wright of Saugerties, N.Y.; seven grandchildren; and three great-grandchildren. For the past 15 years, Ms. Tiernan and Donna Pomponio have been a couple. They married in 2004.